An overview of 2018 Current Projects We are currently running four externally funded projects;  One Paddock Challenge (State NRM)  Subsoil Constraints (Department of Primary Industries and Regional Development [DPIRD])  Weed Action Plan for Bremer Bay (State NRM)  Bremer Bay Community Foreshore and Estuary Protection Project (Coastwest). We are in the process of finalising the contract for a fifth project, the Regional Land Partnership Program, which is the continuation of our NLP project. The funding is from South Coast NRM and jointly administered by the Federal Department of Environment and Energy and Federal Department of Agriculture and Water Resources. Projects completed During the year three projects were completed:  National Landcare Program (NLP) Phase 1 (South Coast NRM from funding jointly administered by Department of Environment and Energy and Department of Agriculture and Water Resources)  Grass-fed Lamb Marketing Feasibility Study (Agricultural Sciences Research and Development Fund, Department of Primary Industries and Regional Development [DPIRD], Regional Development Australia).  Linking Bremer Bay to Point Henry walk trail (Lotterywest, Great Southern Development Commission, with administrative assistance from Shire of Jerramungup and Greenskills Albany). Events and workshops The group coordinated nine events throughout the year, from Bremer Bay to Jacup, Needilup, Jerramungup and Gairdner. 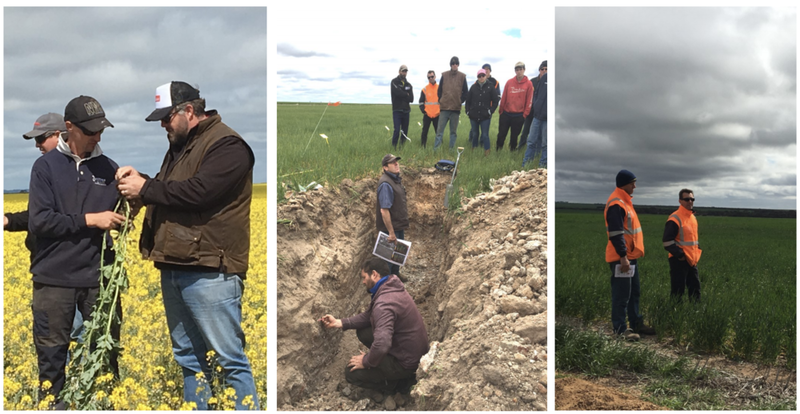 In addition to our Farmer Updates, Spring Field Day and Fitzy Fox Shoots, we held a dry season workshop, an economically driven revegetation field walk, a low stress stock handling course and an airseeder demonstration field walk. We’ve had stalls at market days and the skate park opening in Bremer Bay. We celebrated the opening of the Native Snail Trail in Bremer Bay and participated in the Biosphere launch in Hopetoun in March. We took advantage of social media training offered by South Coast NRM to better extend our reach into the digital world. By the time this year is over we will have launched our new website. Governance training through South Coast NRM also assisted us with another necessary action we had to complete this year: the update of our constitution to meet new Incorporations Act legislation.